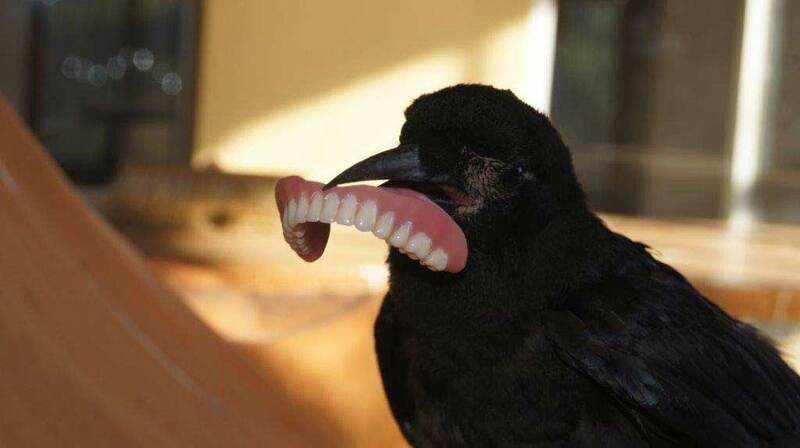 An man from Eastern Cape in South Africa has snapped a picture of his pet crow's cheeky grin after the bird stole his false teeth. Chris Pretorius, who rescues and rehabilitates injured animals on his farm outside Grahamstown, was cleaning his bottom set of dentures in his bathroom on Monday morning when his phone rang. He rushed into his bedroom to answer the call, and later found Blackie, his tame crow, in the lounge flashing an unexpectedly broad grin. Blackie was rescued by Pretorius in December after he almost died from heat exhaustion. He has now made himself at home, and cannot leave anything alone, Pretorius said. Blackie did not want to hand over the teeth, and Pretorius could only retrieve them when Blackie hid under a cushion. Pretorius added that this isn't the first time a crow has pilfered his pearly whites, saying he was lucky Blackie was indoors so he couldn't fly off with them "like another crow did a couple of years ago." Crows are too damned clever, I dread to know what nefarious schemes they'll come up with with a set of human teeth.